Walkie-talkies strapped to each hip, cones in each hand, and speaking on a cell phone nestled between her ear and her shoulder, Charity Norman patiently resolved a potential traffic snarl. It was one of more than 100 conversations Norman engaged in Tuesday morning while directing the Move-In of approximately 2,100 students. 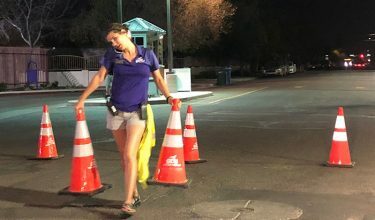 Talk about multi-tasking — with her two walkie-talkies attached to her waist, Charity Norman talks on her cell phone while moving two traffic cones. Norman and her dependable, quick-thinking staff, along with student leaders and volunteers, managed to move students into four different buildings in a little more than five hours despite a predawn lightning and rain storm that briefly delayed the process. 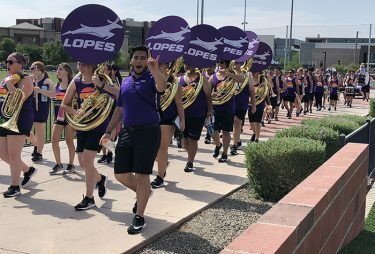 The demands of the Welcome Week schedule — 3:45 a.m. arrival on campus and nonstop work until at least 5 p.m. on five consecutive days — not to mention the enormity of the logistics, might give a mere mortal pause, yet Norman jumped in with both feet when she came to Grand Canyon University in 2015. Jeremy Mack, who said he couldn’t recall a lightning storm at Move-In during his 10 years of helping at the event, directs traffic. 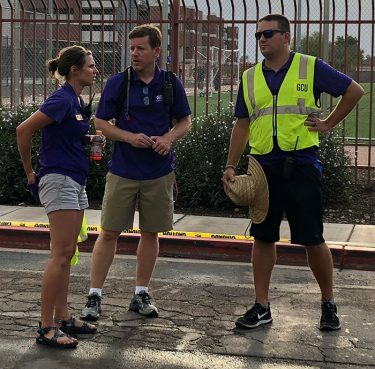 Directing carloads of families from perimeter streets to residence halls requires an army of walkie-talkie-equipped, safety-vested staff members and a boatload of properly marked signs and cones. Norman and her top assistant, Erik Nelsen, rely on many University leaders who step away from their day jobs for one week of exceptional commitment and collaboration. On Tuesday, for example, Pastor and Dean of Students Dr. Tim Griffin helped Norman resolve a traffic-signage issue, Director of Student Engagement Jeremy Mack directed traffic for five hours in a semi-muddy entry point, and Campus Recreation Director Matt Lamb and Residence Life Director Matt Hopkins collaborated with Norman and Nelsen to make numerous decisions. Dozens of other “captains’’ supervised every step of the process, including initial greetings, writing the students’ names and hall numbers on their windshields, and checking them into the housing check-in database via cell phone. Norman consults with two of her top lieutenants, Matt Hopkins and Matt Lamb (holding hat). An unruffled troubleshooter, Norman developed her clear-headed approach to stressful situations while working the front desk at the Admissions Office of her alma mater, Cedarville (Ohio) University. From there, Norman was promoted to Alumni Relations, which included coordinating 50 homecoming events over a two-day period. 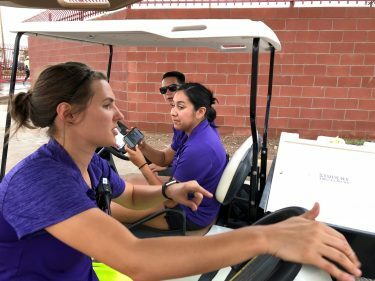 Armed with logic and a keen attention to detail, she took over GCU’s Welcome Week four years ago and all Welcome Programs earlier this year. When Residence Life Manager Holly Neely bestowed upon Norman the “juggling award, for managing a million things at once while keeping a smile on her face,’’ she could imagine Norman’s nonplussed response to Tuesday’s storm. Erik Nelsen, Norman’s top assistant, arrives with his leather briefcase. 3:40 a.m.: Wearing her new birthday sandals and clutching a bag of 50 markers, Norman arrives at her first-floor office in the Student life Building. 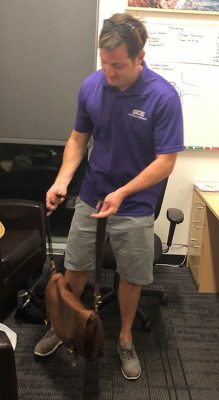 3:50 a.m.: Nelsen arrives lugging a leather briefcase. This is only his second Welcome Week, but he is indispensable, according to Norman. A quick study, he exudes a warm, approachable manner. 3:55 a.m.: Norman and Nelsen gather sticker boxes with residence hall names on them. The ones for today are Juniper, Agave, Acacia and Cactus. 4:05 a.m.: Norman checks each walkie-talkie, making sure it is charged. 4:15 a.m.: In front of the Student Life Building, in the darkness, she takes inventory of all the golf carts, matching cart keys to cart numbers. 4:25 a.m.: Norman begins to greet arriving captains on the second floor of the Student Life Building. 4:40 a.m.: By cell phone, Norman consults with the Phoenix police about the lane-closure configuration on the perimeter of campus. The walkie-talkies sit in boxes fully charged, ready for another day of use. 4:50 a.m.: Norman gets into her golf cart and checks A-frame signs along a path to The Grove parking garage. A few identifying and directional signs are missing, so she requests replacements via walkie-talkie. 4:55 a.m.: Norman enters a storage area in the garage. It is pitch black as she searches for cones and specific A-frame signs. 5:01 a.m.: A captain reports on the walkie-talkie that there are not enough student volunteers arriving in her area. “Charity, how would you like me to handle it?’’ she asks. Using her other walkie-talkie, Norman contacts Nelsen and requests extra student volunteers for that spot. 5:10 a.m.: An official from Public Safety announces on the walkie-talkie that he is opening the Missouri Avenue gate to traffic. These cars will flow through campus to Juniper. Families waiting for the Agave Apartments Move-In to begin also had to sit through a thunderstorm while idling in their vehicles. 5:11 a.m.: Hopkins informs Norman via walkie-talkie that the signs at Juniper need to be changed out. 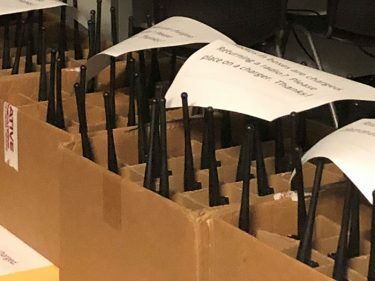 5:12 a.m.: Norman asks Public Safety for a better channel connection on the walkie-talkie. 5:13 a.m.: Norman informs Nelsen that sign No. 8 Orange left is missing. 5:15 a.m.: Norman drives from The Grove to the 29th Avenue parking garage. In the dark, students walk in pairs and bunches from their “home’’ buildings to either Agave or Juniper, the first buildings scheduled for Move-In on this day. 5:22 a.m.: Norman talks to Griffin about missing signs. The first signs of lightning begin to flash in the distance, and Norman drives out to the campus entry point near 28th Avenue and Camelback Road. 5:27 a.m.: As the storm rolls in, Norman, Hopkins and Mack discuss contingency plans if the storm forces Move-In to pause. As vehicles reach the check-in point, senior Reagan Capaci writes the building and room number on the windshield and a fellow volunteer logs it in via cell phone. 5:32 a.m.: Lightning is more frequent and the rain increases as Public Safety requests a Move-In pause. Captains move their volunteers to shelter at Agave and Juniper. 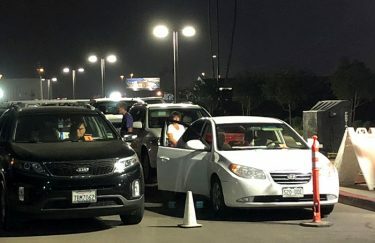 Meanwhile, the arriving families whose vehicles are lined up inside the entry points wait out the storm in their cars. 5:39 a.m.: In the 29th Avenue garage, Mack tells Norman that he has never experienced lightning in his 10 years of Move-In. 5:44 a.m.: As the lightning abates, Norman, Hopkins, and Mack head into the rain to discuss the forecast with two members of Public Safety. 5:53 a.m.: The storm dies out and the Move-In pause is lifted by Public Safety. 6:07 a.m.: The first cars at each entry point begin to move. 6:09 a.m.: Norman helps another lost family. 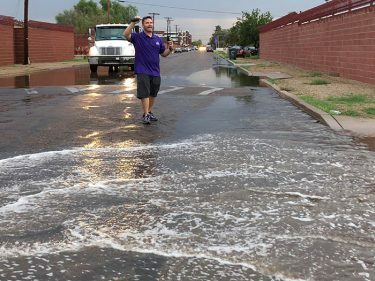 6:10 a.m.: Student volunteers at Juniper and Agave greet students and their parents with cheers and chants, unload their cars, and carry the belongings to their rooms. The process repeats at the buildings for the next 2 1/2 hours. Norman consults with Marissa Reyes and Steven Owens. 6:17 a.m.: Norman drives over to the 28th Avenue entrance and consults with Griffin. Two student volunteers and a Phoenix police officer eye the “Agave/Cactus’’ sign pointing travelers from Camelback Road to the turn-in. “That’s your first freshman test — if you can read this sign,’’ said the officer. 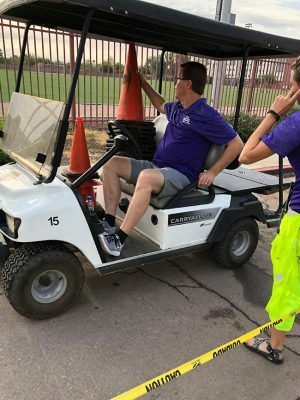 6:30 a.m.: Norman drives back onto campus, passing a cart with a Public Safety officer, who says, “I see you have a gas can today,’’ in reference to a cart running out of gas Monday. 6:38 a.m.: Norman shows a volunteer how to force approaching drivers to split into two lanes by standing in the middle. 6:40 a.m.: Since more cones are needed for lane splits, Griffin volunteers to search for more cones. 6:42 a.m.: Norman encounters another lost family and kindly redirects them. Dr. Tim Griffin, Pastor and Dean of Students, arrives with more traffic cones. 6:50 a.m.: Norman, Hopkins and Lamb oversee a new configuration near Agave that speeds up the traffic. 7:42 a.m.: Norman drives to the check-in’ lane, that runs past the Mail Center and Encanto Apartments. Hopkins provides an update on the walkie-talkies reporting how many students have checked in so far in Juniper and Agave. 7:50 a.m.: Norman drives to Agave, stopping to gain an update from student leaders Marissa Reyes and Steven Owens. At Agave, she praises student volunteers. 8:15 a.m.: Agave is ahead of schedule. The number of cars has slowed to a trickle. 8:22 a.m.: “Shut it down,’’ Norman says happily into the walkie-talkie. 8:25 a.m.: Norman and Nelsen each drive carts to GCBC for their first coffee of the day. 8:30 a.m.: A student hails Norman in her cart, informing her that her friend can no longer walk on an injured knee. Norman orders a shuttle via walkie-talkie. 8:32 a.m.: Norman marvels at the speed with which Juniper unloaded. 8:39 a.m.: The cars lined up with Cactus-bound and Acacia-bound families are released to move, almost an hour ahead of schedule. They snake through campus as student volunteers start the unloading process. 8:50 a.m.: Norman calls the lunch organizer on her cell phone and tells her that there is no need to push lunch back a half-hour. The Welcome Crew should be ready to eat between 11:30 and noon. 8:52 a.m.: Norman is informed via walkie-talkie that the sound system at Cactus is malfunctioning. A captain offers to deliver a new speaker. 9 a.m.: Norman drives out near the Cactus entry point. Away from the hundreds of volunteers unloading at buildings, Phoenix-based sophomores Frida Moreno and Selena Nguyen are nearly alone in a vast parking lot. Enthusiastically, they greet every family. 9:15 a.m.: Norman meets with Lamb to discuss potential foot-traffic issues that could arise near The Grove (Acacia, Juniper, Willow and Ironwood). “I want Lamb’s brain on this,’’ she says on the walkie-talkie. … But the arrival of the Thundering Heard Pep Band helped everyone re-energize. 9:40 a.m.: Norman runs across Justin McLean and Nicole Schember in their cart. She asks them to clean up and put things away from Juniper and to drive to her office and load stanchions to help with foot traffic at Acacia. They are so capable and reliable that they appear to be staff members, yet they are student leaders. 9:55 a.m.: The stanchions arrive, but after setting them up, Norman and Lamb determine they will not work. Norman loads them into the back of her cart. 10 a.m.: The long path near Acacia permits 16 vehicles to be emptied at once. 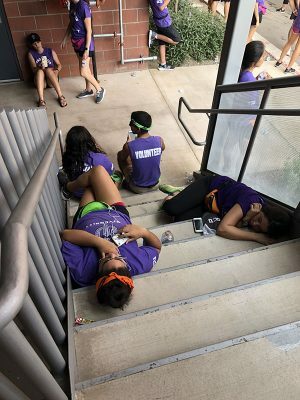 Yet the hard-working students, who have been awake since 4:40 a.m., are starting to flag from fatigue and hot temperatures. One group seeks a break in the shade. 10:07 a.m.: A drumbeat draws closer and closer, crossing campus and approaching Acacia. A huge pick-me-up arrives in the form of the Thundering Heard Pep Band, Thunder, Cheer team and Dance team. They perform on the move and then stop on the turf field for a series of uplifting songs. It is no exaggeration that the student volunteers are energized. Emptying 16 cars at once speeds up the line at Acacia Hall. 10:40 a.m.: Norman drives back over to Cactus, where the line of cars is disappearing. 11 a.m.: Only a handful of cars remain in line at Cactus. There are still close to 100 cars in line for Acacia. 11:15: a.m.: The weary Cactus volunteers are thanked for doing an amazing job on Cactus but then gently informed that help is still needed at Acacia. 11:16 a.m.: Cactus volunteers walk to Acacia, where they join with the Acacia volunteers. 11:40 a.m.: Acacia Move-In is complete. Norman and her vast team are fatigued, famished and fulfilled. Noon to 5 p.m.: Norman spends the afternoon at two events, New Student Orientation and the Orientation Expo, then runs a debriefing meeting with all of her Move-In principals. At 5 p.m., she finally heads home to rest up for another day. 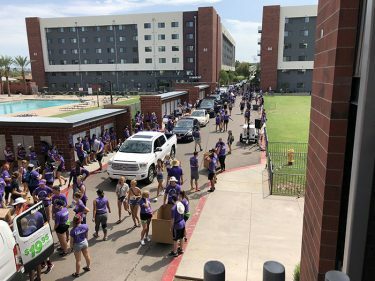 Move in day at GCU is one of life’s amazing and inspiring experiences! Thank you just isnt enough to all the high energy, selfless individuals who come together and operate as one amazing human unit to make it happen!